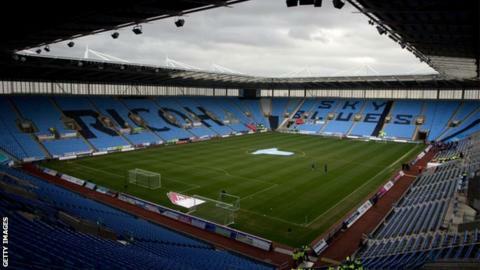 Coventry City play host to Gillingham at the Ricoh Arena on Friday, 503 days after last playing at their home ground. Since then, while the team have been in exile in Northampton and the club's owners have been otherwise engaged in a public fall-out with the stadium's owners, football has had to play second fiddle to a succession of sideshows at the Ricoh - musical and otherwise. Admittedly, one of those events involved rock legend Bruce Springsteen bringing his E Street Band to the city but on Friday the Ricoh reverts to its originally planned main function, for a League One game against Gillingham. The Ricoh began life as a football stadium when City first left Highfield Road, their home for 106 years, to play there in 2005. For the majority of Sky Blues fans, this will be their first 'home' game since 20 April 2013. For the minority who made the 68-mile round trip to Northampton to watch City play at the Sixfields Stadium during the 2013-14 season, life will suddenly seem a lot less complicated. And for the owners of the Ricoh and the club who both, in their own separate ways, lost an entire season's worth of revenue, it is time to forget about what has been lost and concentrate on the club's future, back where they should be. "It's still very much the club's focus and intention to own its own ground in order to access the revenues that come with it," said City's Tim Fisher, who took over as chairman this week in a boardroom reshuffle which saw Steve Waggott take on the role of chief executive. The Ricoh Arena may not necessarily have proved as popular as Highfield Road when it first opened but, after all the City fans have been through, it will sure feel like home now - as they finally start the longer, more relevant journey of what they hope will be a trip back to the top flight of English football - an experience last tasted in 2001. Coventry City defender Jordan Willis and midfielder Conor Thomas, who were both born in the city. "Being born here and growing up as a fan I think it means more," said Willis. "But everyone knows how important it is. "It's just massive. I can't wait. I've had family on all week asking me to get them tickets. Everyone in the city just wants to be a part of it. The fans will give us an extra lift, especially with the game being a sell-out." "We must not let the occasion get to us," added Thomas. "We have to give them a reason to keep coming back. "It's what the fans deserve. It's given the whole club a boost from top to bottom. As a player, you want to play big games in front of big crowds." "All the fans are delighted to be back in our city. We should never have left in the first place. I hoped this day would come but, as time dragged on, we did think 'How much longer will we be here?'. I'm so happy. It's been the best news most of us have had in ages. "Playing in front of 1,000 paying people has been pretty embarrassing. We were effectively turned into a non-league club. "Fans have been divided. Many friendships have broken up. Watching City at Sixfields has been depressing. No-one wanted to be there." "After many wonderful memories at Highfield Road, it was difficult to adjust to life in our new home in 2005. "I didn't enjoy my first trips to the Ricoh. The new routine was different, the journey longer, the atmosphere was sterile inside the ground and the outer surroundings didn't cater for traditional football fans - no pubs, no chippie, no bookies, just an enormous supermarket. "However, after the first few weeks, aided by a decent run of consecutive home wins, I started to appreciate it. The new facilities were excellent, they introduced an innovative cash-less payment system and it was added to the list of 2012 Olympic venues. "I was aware of the long-standing rent dispute but never thought that we would actually vacate the Ricoh Arena. I refused to go to Northampton. I have no friends or family there, I didn't go to school there, I've never even been there and, although it's cheaper to travel from my London home, I simply couldn't renew my season ticket. "I boycotted Sixfields, only attending away games. The first two 'home' games at Sixfields produced 17 goals but I still stayed away. "I'm delighted the club is returning to the Ricoh. They obviously realised that a club is nothing without its fans. The numerous summer departures have left us with a very young squad so there is a tough challenge ahead, but our manager Steven Pressley has done a fantastic job considering the circumstances. I hope we can now start rebuilding, rather than waste time pointing fingers at the council or the owners." "You couldn't not get excited about it. I can't wait to go back there. Friday night will be a special night. One to remember and it's looking like we could sell out which would be incredible. "To have that kind of support can spur us on to great things. We know that we have to win games to get that positive atmosphere around the ground, and if we start doing that, we can help each other, and make it an intimidating place for teams to come, a fortress. "Players coming here will be up for it but we need to deal with that. If you play for Coventry City, there are pressures and expectations. We are a big club, and if you can't deal with those pressures then you can't be here. There is a responsibility and an expectation always, especially when we return to the Ricoh. But it's something that can and will be managed. "I said we wanted to return with momentum and we're currently five games unbeaten. We're all excited but we've got to make sure we play the game and not the occasion." "The interest and furore surrounding City's first game back at the Ricoh Arena illustrates how much it means to Coventry people to have the club back home and how much they love their football team. It seems the club underestimated that strength of feeling when they opted to ground share at Northampton while their dispute with the Arena's management and the council remained unresolved. "They thought they were being realistic when budgeting for crowds of around 3,000 at Sixfields. In fact, they often attracted less than half that figure. "When the dust settles after the Gillingham match, attention will focus on the long-term future. Presently the club are only committed to playing at the Ricoh for two seasons and the issues leading to their exile are still apparent. But, with new personnel at the head of all the relevant parties, prospects of finding a permanent solution seem much more hopeful than they were. "Interestingly there's been a notable change of language from the club who now talk of the need to 'own' their stadium, rather than of 'building' a new one. It seems clear that a long-term future at the Ricoh Arena is the only one most Coventry City fans are prepared to accept."